Lucas was recently sent* Hornby Hobbies My First Scalextric set, £39.99. 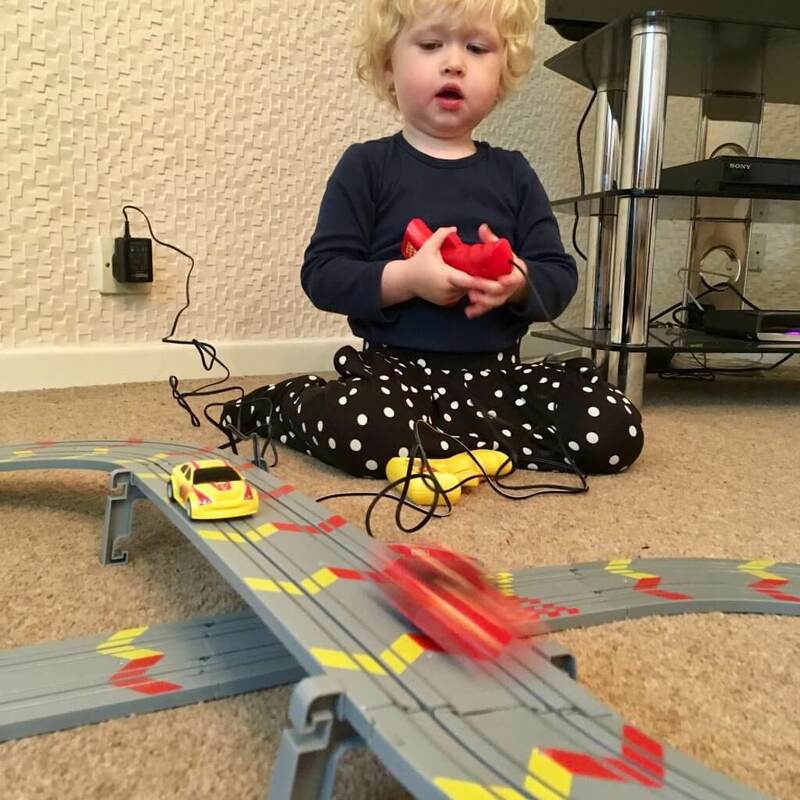 When I told D we had been offered one, he was very excited about it as he remembers the fun he had on his Scalextric when he was younger and couldn’t wait to introduce it to Lucas. 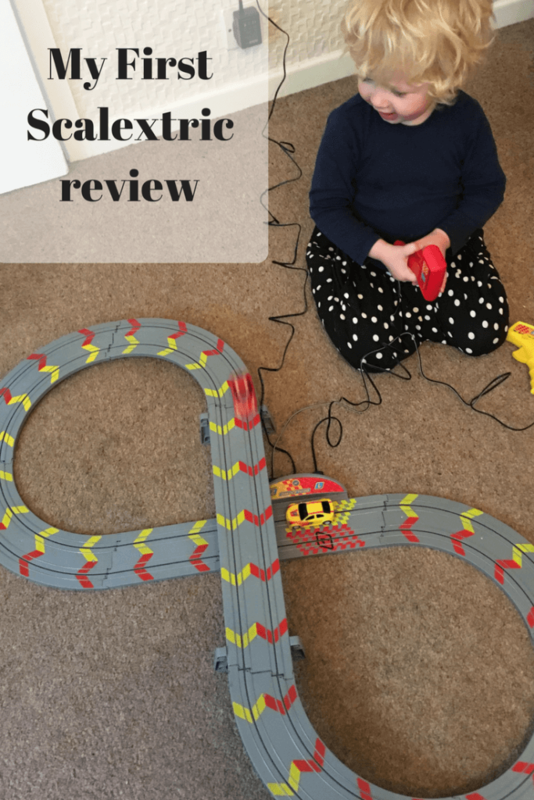 My First Scalextric is a fab introduction to the world of Scalextric racing for children. It is aimed at children 3+ but Lucas is 2, only 3 in February. He absolutely loves it and is always asking to race. It’s a great family fun activity everyone can get involved in, although Lucas needs reminding of this as he will happily race himself whilst controlling both remotes. 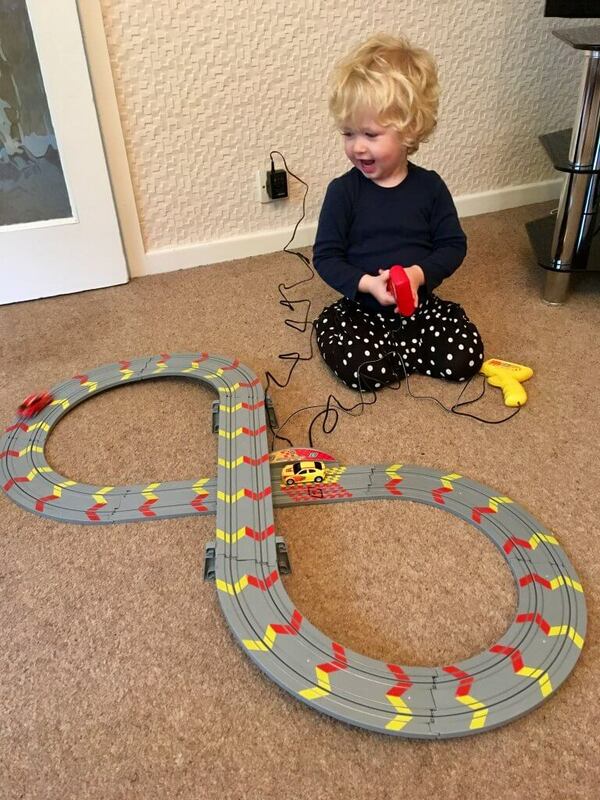 The track is an easy to assemble figure of eight and comes with two remotes and two cars. The two rally cars and adjustable power hand-controllers are colour coded in red and yellow to match chevrons on the circuit, which makes it easy for smaller children to follow and encourages their hand eye co-ordination. Their Magnatraction technology helps to keep the cars on the track, and variable hand-controllers allow the speed of racing to be adjusted depending on skill level. Lucas still needs to master this and often goes flying off the track on one of the corners, but this is a perfect way to increase his motor skill development. We are big fans of Scalextric and I love that you can extend this with the other ranges too. I love the photos, he looks so happy! We used to race cars like this when I was younger,our cars and tracks were made by a company called Tyco. And we used to race for hours as well…. My children love racing their Scalextric and it reminds me of all the fun we used to have with our set when I was younger. I think my son would love this. He is 3 in December and I can see this being a perfect gift for him. This is such a great toy for children! I remember when I was little and a friend of mine received a similar set for Christmas, we used to play with it every day and never get bored.